Send a message to your friend - even if they aren't online - and keep in touch. They'll get your message the next time they play! See your friends' Tinkas, their Tinka Fair submissions, badges they've earned, their TinkaPad - AND check out their friend list! Connect with even more creative kids! Now your profile is tidier, fancier - and can be customized! Check out all the available paper+book cover stylings! Make your profile your own. The Tinka Fair - OPEN FOR ALL TO SEE! See your projects featured on the website! Browse the most creative projects. 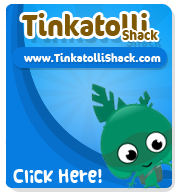 Show your friends and family what everyone on Tinkatolli is up to! In addition to MAKEABLES, we now have MAKE. This category contains projects that were previously found in "Craft" and "Art"
Submit something new today! Make it awesome and it could get featured!